The Canon Digital IXUS 900 Ti is currently the flagship model of the Digital IXUS range (also called the Canon Powershot SD900 in the USA). Finished in precision-crafted titanium and retaining the Perpetual Curve design of its predecessors, the Canon Digital IXUS 900 Ti offers 10 megapixels, ultra-compact 3x optical zoom lens, Canon's new DIGIC III image processor with advanced Noise Reduction technology, and Face Detection AF/AE. Other standout features include ISO 1600 for flash-free low light shooting, 2.5� high resolution LCD with wide viewing angle, plus 18 shooting modes, including two new Special Scene modes � Aquarium and ISO 3200 (1600x1200 pixel images only). Canon have billed the Canon Digital IXUS 900 Ti as "the perfect combination of pioneering technology and arresting design." We find out if it is simply a good camera in our latest in-depth review. The IXUS branding graces Canon's flagship compact range � smaller yet tougher than the (typically cheaper) PowerShots, boasting eye-catching design and, increasingly, features such as image stabilization (not included here, if seemingly only to indicate a degree of diversity when viewed in the context with the rest of the range) and face detection technology (which is included). IXUS cameras don't come cheap though, demanding a premium for extras like steel � or in the case of this Canon Digital IXUS 900 Ti, the stronger yet lighter silky-smooth titanium (hence the 'Ti' suffix) � bodywork that will appeal equally to the business executive and gadget enthusiast. The latter helps make this latest top-of-the-pile Canon, at a penny shy of �400 in the UK, some �100 dearer than rivals also boasting a ten megapixel resolution and a fairly unremarkable if we're being honest 3x optical zoom. But, to be fair, the Canon Digital IXUS 900 Ti feels reasonably weighty in the palm with lithium battery and supplied 32MB SD card inserted (interestingly there's no internal memory to fall back on). Build quality is almost ridiculously high given its credit card-sized dimensions, and, by retaining the 'perpetual curve' design of its predecessors (to partly disguise its boxy-ness), the Canon Digital IXUS 900 Ti certainly resembles the high fashion accessory the company had hoped for. A little bit flash, but still affordable, it's the Porsche 911 of digital compacts. As with the 800 IS, a 2.5-inch, 230k pixel LCD screen takes up most of the space on the camera back, yet the company has still managed to squeeze in a teeny optical viewfinder above to placate the photo enthusiasts who make up the core of Canon's user base. With the screen visibility being perfectly clear in sun or shade it seems slightly superfluous however, and, if you do bring your eye up to it, your nose makes contact with � and inevitably smears � the LCD. Top right of the screen is a minimalist mode dial with raised lip that ensures it makes firm contact with the thumb. Ranged around this are self-evident options for playback, auto capture, manual mode, 11 scene modes (including a high sensitivity ISO3200 setting plus one for shooting in aquariums) plus video capture. Tucked beneath the dial are Canon's standard print/share and display buttons � the former enabling the camera to be used in conjunction with its standalone printer range and the latter a means of turning on/off the information given on the monitor screen � or the LCD itself. 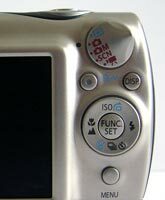 Below is the typical four-way controller � or what Canon calls the touch control dial � via which ISO speeds (up to ISO1600), flash settings, macro or infinity settings, plus the delete, continuous shooting or self-timer settings are selected. Slide your thumb over this control and a 'virtual' version appears on the right of the LCD screen to aid selection, the dial itself being so small that your thumb completely covers it when effecting changes. Resting at the heart of this touch control dial is the Function Set button which, when pressed, calls up an L-shaped toolbar of options down the left-hand side of the screen. In auto mode you get the pared-down options of selecting superfine, fine or normal image quality, and a range of file sizes, from a 3648x2736 pixels 'large' file, through to the standard 640x480 pixels (small file) for internet use, plus postcard (1600x1200) or widescreen ratio (2648x2048) shots, the last surely for anybody missing the APS film IXUS of yore. 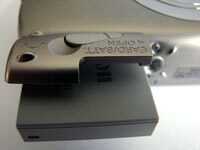 Up top is a responsive zoom lever encircling a large and springy shutter button, to the left of which (if viewed from the back) is a neatly recessed on/off button, and at the far left, a built-in speaker, subtly indicated by a inset detail that resembles a scattering of petals, or possibly pebbles. The front of the Canon Digital IXUS 900 Ti boasts an attractive mirrored circular finish around the lens, recessed and covered when not in use, above which sits the circular window for the optical viewfinder and a triple use lamp that acts as an AF assist beam, red eye reduction lamp and self timer lamp, to the right of which is situated the thin strip of the flash bulb. Although, with the exception of the main shutter button, attendant controls are designed to blend in with its minimal looks, everything feels 'just right' on the Canon Digital IXUS 900 Ti given its point and shoot status. It sits comfortably in both palm and pocket, the raised lip of the mode dial (perhaps inadvertently) doubling up as a aid to achieving a firmer grip when holding the camera in one hand. The provided strap can be attached if you're afraid of it slipping from your grasp, due to the smooth tactile nature of its surface. The 800 IS' fairly long-in-the-tooth (by digital camera standards) Digic II processor has had an upgrade in the logically named Digic III successor found in the latest EOS DSLRs, though speed of operation � already pretty good before � doesn't seem to have jumped ahead noticeably. It's still very impressive though, the Canon Digital IXUS 900 Ti powering up ready for the first shot in just over a second, the LCD blinking into life almost instantly and the 3x zoom, hidden within with body until now, immediately extending to maximum wide angle. 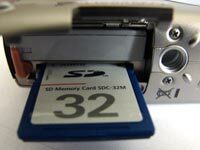 It's also quick to find critical focus, displays little in the way of shutter delay and writes to card within a couple of seconds. 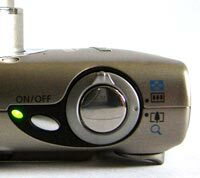 The settings displayed as a default on the Canon Digital IXUS 900 Ti's screen include the IXUS regulars of chosen shooting mode, flash, resolution and quality setting, plus the number of shots remaining. Flip the dial to 'manual' and an ISO setting is also displayed, while a further twist to scene modes displays whichever has been selected by the user. In video mode you get the frame rate, resolution, metering and available memory denoted in time remaining in minutes and seconds. Press the dedicated menu button and you get a choice of three folders on screen. The first, denoted by the familiar camera icon, adds face detection to the AiAF mode (rival compacts have a dedicated button for this feature, but here it's buried away within the menus), along with the choice of activating the likes of digital zoom, red eye and self timer, while switching to manual mode ads the likes of slow synchronization and a long shutter option. The second folder contains the set up menu, denoted by the familiar spanner and mallet. This provides all the basic options � including the ability to, if wished, turn off the rather nifty virtual touch mode, as well as formatting the card in use and resetting all options. The third and final folder, as I mentioned in my review of the Canon 800 IS, is largely superfluous as far as photographers go, merely allowing start up images and sounds to be messed about with. Once again, these settings are mirrored in manual mode, scene mode and, to a much lesser degree, video mode. As with other Canons, the essentials of resolution and file size are pre-determined with a press of the separate function button in all shooting modes. While you're limited to adjusting file size and compression level in auto mode, the manual option extends this to the full complement of +/- 2EV exposure compensation, adjustable white balance, the easy to overlook 'My Colors' option, metering (evaluative, centre weighted average, plus spot), ranged down the left-hand side of the screen; all options are denoted by a mix of letters and icons that will be instantly familiar to any compact camera user. Although I personally don't bother with Canon's 'My Colors' options � I'm pleased with the output straight from the camera, and save a quick tweak in Photoshop Levels, most shots are more than acceptable � for those who don't want to mess about with post processing there's the ability to shoot 'vivid' colour, sepia or black and white, plus darken or lighten skin tone, along with a positive film option. In playback the virtual dial comes into its own, indicating the ability to delete images on the fly or jump through whole batches of images at a time when scrolling through shots. Press that menu button again and you get a choice of four folders this time. The first playback menu, denoted by the familiar play icon, provides access to slideshows, along with the ability to arrange images into categories, erase, protect, rotate or add sound memos. My Colors is again present here, allowing colour changes to be made retrospectively � which makes more sense, as you can preview the effects away from the 'heat' of the moment of capture. The second playback folder affords the selection of images for print, while the third and fourth folder are the standard set up, plus start up image and sounds options. Overall operation of the Canon Digital IXUS 900 Ti is as expected � namely fast, accurate and reliable, just about all you could wish for from a compact with a fairly average zoom range and, perhaps because of this, no optical or mechanical image stabilization, which, in truth, is the only area in which it feels like there's something missing. Otherwise it appears as smooth a customer as its titanium bodywork would suggest. PhotographyBLOG is a member of the DIWA organisation. Our test results for the Canon Digital IXUS 900 Ti have been submitted to DIWA for comparison with test results for different samples of the same camera model supplied by other DIWA member sites.